It stimulated my imagination. It was fun to photograph – to find the perfect composition to portray the intrigue I felt. Thanks, Sylvia. We are now in Florida and enjoying the weather. Michigan got really cold right after we left. Love the serenity and the textures you captured. I have mixed feelings about the proliferation of Buddha statues, some of which are downright ugly, but this one is intriguing! Isobel, it doesn’t seem like a Buddha to me. When I first saw it, I thought of women who have been oppressed in most cultures for all of recorded history, buried alive, but still able to have beautiful spirits. But is it supposed to be a Buddha? Here is what is printed about the sculpture: Based in Shanghai, Zhang Huan was captured widespread international acclaim for his performative work, installations and sculpture. Devoted to both Buddhism and the history of Chinese culture, the artist has created numerous works inspired, directly and indirectly, by images of the Buddha. 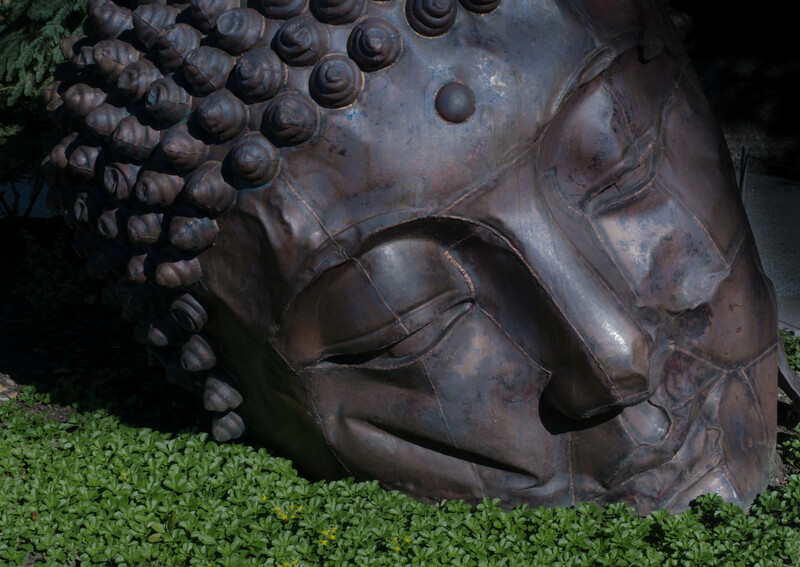 The large steel and copper sculpture, Long Island Buddha, is not intended as a religious image, but its roughened fragmented form is intended to reflect on the seemingly endless chapters of human history where human violence often leads to the destruction of culture and its artifacts. Gorgeous, gorgeous, gorgeous, gorgeous, gorgeous.